Hello Semi Co-op readers! We’re Eran and Aviv, and we’re from a DIFFERENT WEBCOMIC WHAAAAT. 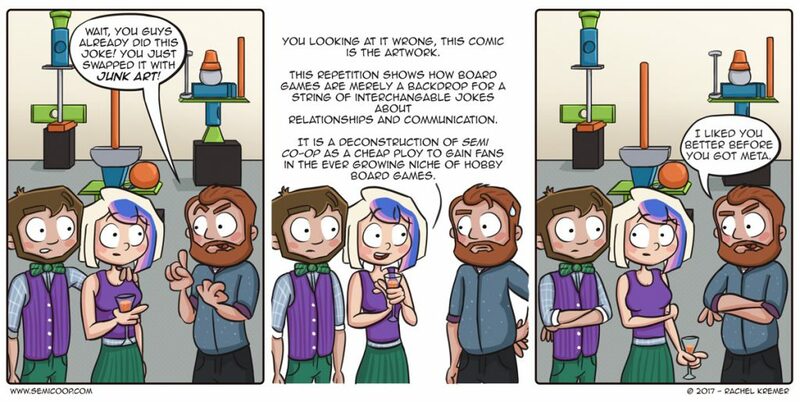 We’ve been posting geeky tabletop strips for the past two years at Up to Four Players, along with some London-related stuff, and some “Israelis away from home” bits, which is quite niche, even for the internet, but there you have it. Starting next year we’re moving away from one-shot boardgames-related jokes to a new style of storytelling, focusing on our protagonists’ role playing adventures, so we’re really happy this Semi Cross-over happened before the Switch! It’s funny, the different way in which you look at a comic when you’re just enjoying it is a reader, and when you’re “researching” it for homage purposes. You pay more attention to characters’ looks, the way they speak, act or emote, the number of cats per person per strip. For example, we’re not sure we ever noticed Rachel’s characters having only 4 fingers before starting to work on our guest comic. Have you? It’s also a cool exercise to take on someone else’s characters and try to balance their inherent style with your own. It kinda reminded us of a special April’s Fools session Eran ran in our D&D campaign, where we each got to play a humorously abridged version of someone else’s character. It’s an interesting experience and lots of fun, so give it a shot, whatever medium you take your characters in! Thank you, Rachel, for doing this switcheroo with us, it was a blast! 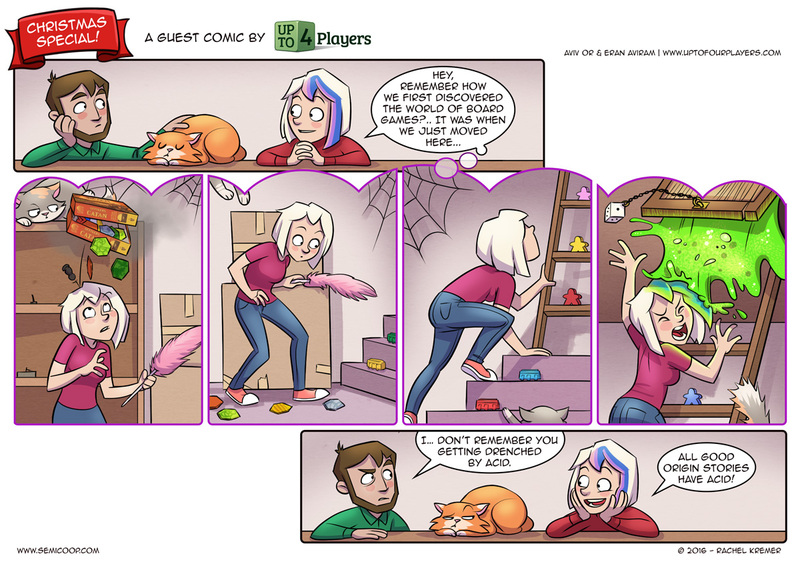 And you guys can check out her guest comic on our website, over there. I read both comics, happy to read both of your semi-cooperation comics! 🙂 Congrats and happy new year!